Cybersecurity is one of the hottest areas in tech. Gartner forecasts worldwide information security spending to exceed $124B** by the end of 2019. As attackers continue to find ways to breach systems, the market for security solutions is growing at a rapid pace with many new entrants and innovative solutions. We need your help solving one of the biggest challenges facing security professionals today – connecting this diverse ecosystem of security solutions to improve the speed and accuracy of cyber defenses. Today, most organizations use dozens of different security products - some focused-on device or user security, others on protecting data and apps, along with tools to help manage risks and investigate attacks. But these products don't often work well together, and it’s up to an organization to try to stitch everything together. This takes time, resources, and frankly just isn't that effective (we've all seen the headlines about yet another breach!).  You have the opportunity to directly solve that challenge with the Microsoft Graph Security API. The Graph Security API is a unified REST endpoint that makes it easy to access and act on security insights from an ecosystem of connected security solutions. The possibilities are endless - see the inspiration and other resources to help you get started. This is open to all Hackathon participants and the Hackathon manager team will also join in to guide and help. The office hours will happen on the 2nd Wednesday of each month for the Hackathon duration. The competition will welcome submitters from around the globe. However, individuals or organizations may be disqualified if they are based in a nation, state, province, or territory where U.S. or local law prohibits participating in the competition or receiving a prize. This includes individuals, who are residents of, and organizations domiciled in Brazil, Quebec, Cuba, Sudan, Iran, North Korea, Syria, Region of Crimea and any other country designated by the United States Treasury's Office of Foreign Assets Control. Those solutions that incorporate use of other Graph services (users, groups, mail, messages, etc.) in addition to the security entities will get extra credit in judging! Learn about the Graph Security API in the Resources tab to get started. Follow the guidance in the Resources tab to either use our demo tenant or follow the steps to acquire your own tenant to build and test your application. Shoot your demo video and take screenshots of your functioning application. Enumerate use cases to clearly call out value proposition of your application. Submit your application on https://graphsecurityhack.devpost.com by March 1st, 2019 for consideration in the hackathon! Indicates creativity, originality, and the potential to significantly improve organizational security. Demonstrates usefulness to an enterprise, for example by streamlining or automating security operations, reducing threat detection and response times, or improving the effectiveness of existing security tools. Includes how well the idea was executed by the developer, including the user experience, the complexity of the scenarios, use of additional Graph entities or data or other APIs, and whether it performs as expected.